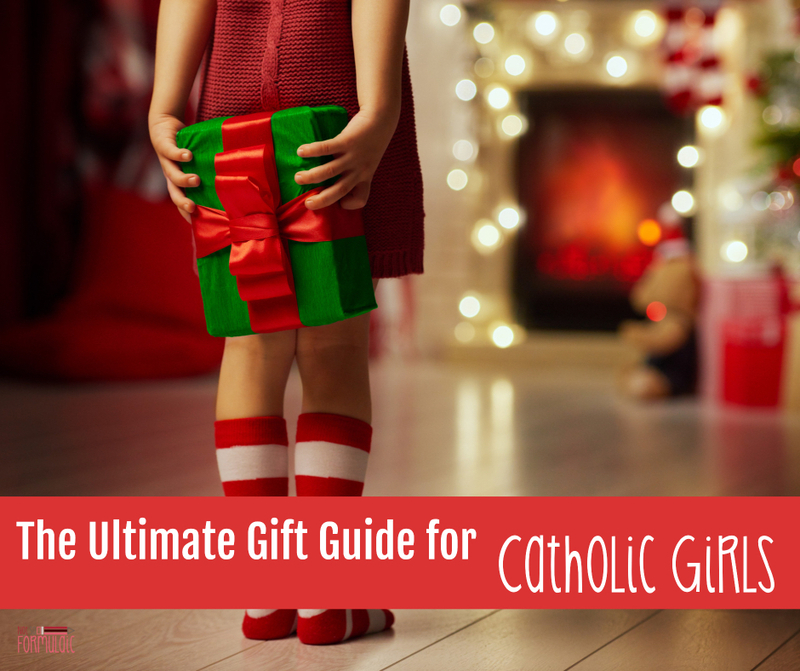 Are you searching for the perfect Christmas gift for your Catholic daughter? 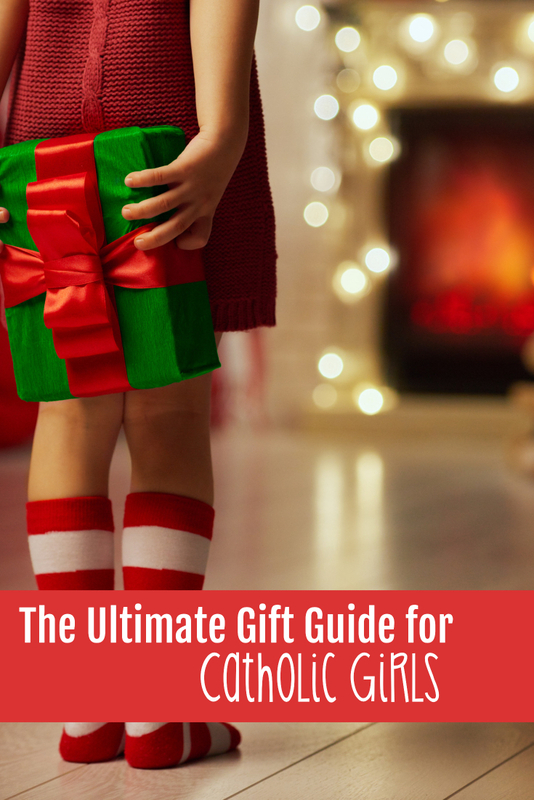 I’ve got you covered in this ultimate gift guide for Catholic girls, full of thoughtful gifts to inspire and encourage her growth in the faith. This post contains affiliate links. I earn a small commission from the sale of some items linked in this post. Please see my disclosure policy for details. Oh, how I loved that giant book of amazing goodness, full of clothes and toys and who knows what else I thought I needed. My sister and I would scrutinize every single page, circling a million things and writing lists just as long. Mom, if you’re reading this – I’m sorry. Now that I’m a mom to two darling girls, I see the pattern starting all over. The Toys R Us catalog arrived the other day, and my two busy bees got to work highlighting their favorite finds. While I love seeing the same enthusiasm and excitement I had as a child, my goal for them this season goes beyond material goods. I want to give my girls the gift of faith – of concrete reminders and encouragement in their journey. 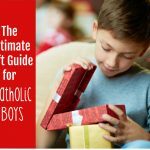 Last fall, I curated a fantastic gift guide for Catholic girls featuring items exclusively from Catholic vendors. 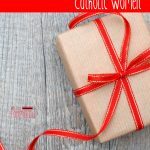 This year I’m happy to bring you a newly expanded, updated gift guide for 2017, full of beautiful items that will inspire our daughters in their journey of faith. Come have a look, support Catholic artisans, and find meaningful gifts your Catholic daughter. Want to support your daughter’s efforts in prayer? 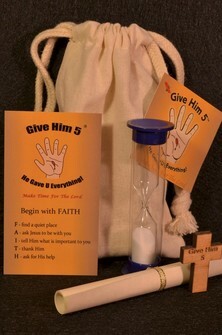 These prayer bags make a great stocking stuffer, and include a 5-minute Sand Timer, a Give Him 5 Pocket Cross, a Give Him 5 Scroll (Explanation of Give Him 5), two Give Him 5 Prayer Cards (one to save and one to give away), and a 4 x 6 inch Muslin Carry Bag. 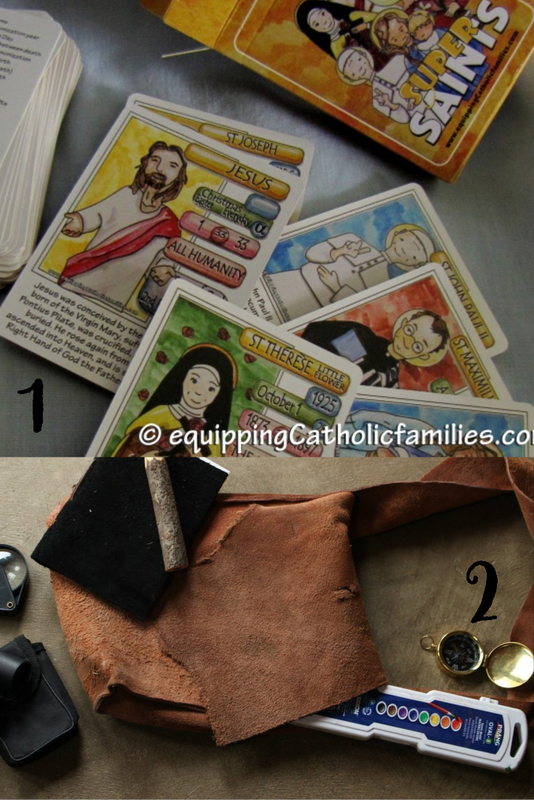 Arma Dei is the one stop shop for Catholic families, offering beautifully designed, authentic Catholic teaching tools that captivate the attention of children. Owner and designer Monica works overtime to provide families and educators the support they need to raise children in the faith. The Super Saints Playing Cards are the only saints cards you can actually play real card games with. How’s that for a little friendly game play encouragement? Bringing a little adventure to your everyday! As a homeschooling mom who follows Charlotte Mason principles, Sarah from Sew Many Wild Things aims to get kids outside everyday with high quality, kid friendly leather satchels and adventure bags. She also handcrafts all natural rustic soaps, leather jewelry, and more. I first worked with Elayne from Annunciation Designs this past summer; she designed the beautiful family mission statement print which now hangs proudly in our home. While Elayne’s hand lettering is gorgeous, the stay-at-home mom and part time math teacher also creates some beautiful embroidered jewelry. Take a gander over at her shop; I promise you won’t be disappointed. Last day for Christmas delivery: Dec 10th. A bit of a nomad at heart, Rakhi McCormick is a Michigan-based self-taught artist, letterer, and crafter. She is a Catholic convert, wife, & Mama to 3 littles who loves Jesus, coffee, food, chasing light, sharing GIFs, & singing loudly! Her shop, Rakstar Designs, is an outlet for her to share the beauty of the Catholic faith and the truth about who we are as children of God. Rakhi’s dearest hope is that her work shines light and healing into the broken parts of our souls and lives, helping us to remember that we are loved and never alone. 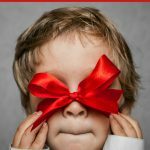 Discount code: ULTIMATEXMAS for 20% off $40 or more. As a Catholic mom of four, Maria Victoria knows the importance of supporting our daughters in their walk of faith. 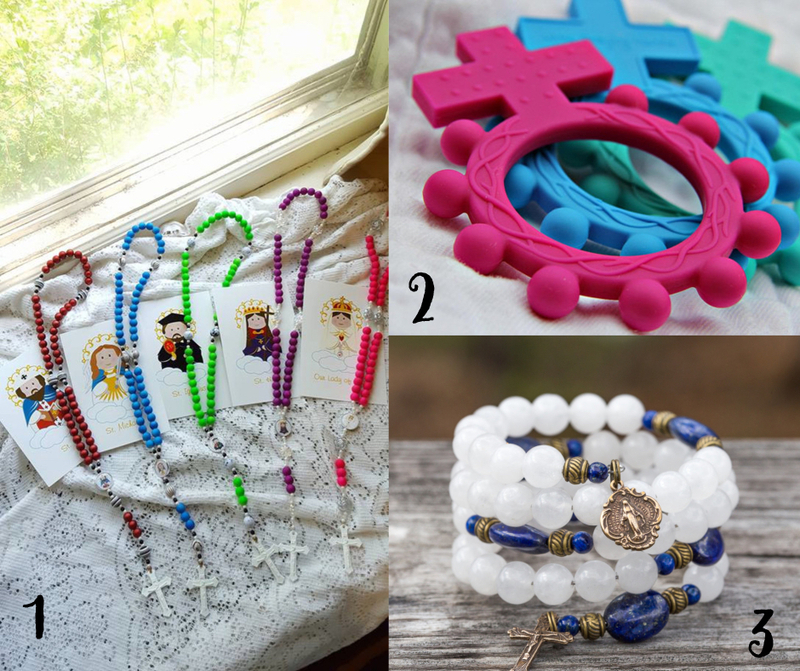 Her shop, AveMaria Faith Crafts, offers a wide variety of jewelry and accessories handmade for with love for Catholic girls. Want an Anthropologie vibe with Catholic virtue? Then Jill Simon’s Pink Salt Riot is the shop for you. 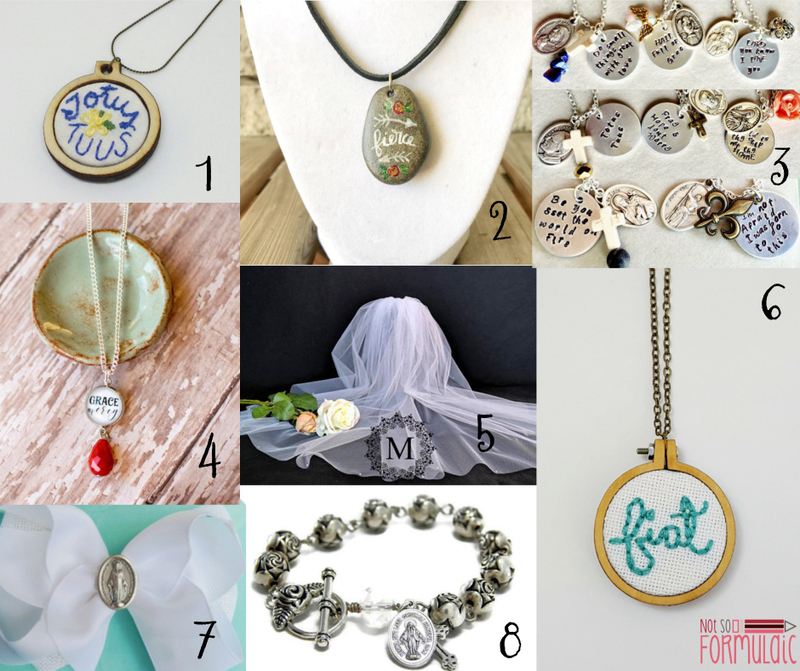 Jill’s eye for design and passion for Christ make her hand lettered and typographic jewelry a sight to behold. Her Blood of Christ necklace pictured above? Absolute perfection. Maria began wearing mantillas during college. She decided to start an Etsy shop to spread the devotion! Maria provides high quality mantillas in various styles, including some one-of-a-kind creations only available for a limited time. First Communion, wedding veils, and custom design orders are also available! Theresa is a mama to four little souls (including two in Heaven) and wife to a wonderful man. After becoming a stay at home mom, she desperately needed a way to fund her irrepressible need to create. Happy Nest Home Goods offers embroidered and beaded goodness made with love, including embroidered wall art and jewelry, essential oil diffuser jewelry, and sacrifice beads. 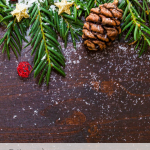 Last Day for Christmas delivery: embroidered items: November 27 ; beaded items: December 16. Homeschooling mom Ceci designs, creates, and sells beautiful religious hair bows. Custom designs include miraculous medals, saint medals, and pro-life awareness medals on a variety of textured and colored ribbons. Hair Bows for Life aims to raise awareness for the sanctity of all human life by giving back to the pro-life communities. Darling bows and proceeds to a good cause – what’s not to love? Rose describes her handiwork as unique, faith-inspired jewelry that combines remnants and relics from bygone eras with stylish, modern designs. I agree – her work is gorgeous and unlike any miraculous medals you’ll find! She’s always experimenting with new techniques and finishes, showcasing a variety of styles and pieces with which to share your faith. Amy is a writer, adoption advocate and deeply in love with her faith in the Lord! 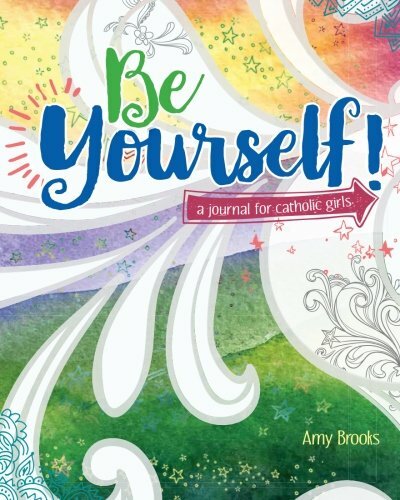 The Be Yourself Journal guides girls into finding their mission and identity in Christ through prayer journaling. 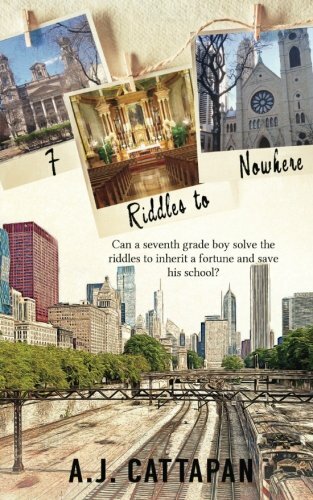 Have a tween or teen who loves good fiction? 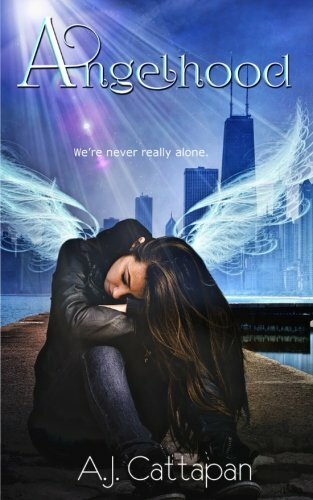 Check out these solid YA novels from award-winning, bestselling author A.J. Cattapan. Julia is a former teacher and catechist, turned stay-at-home mom and freelance writer. 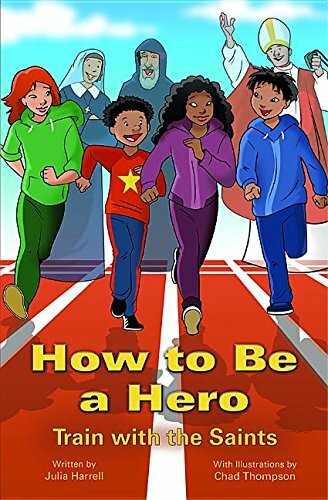 Her first book, How to Be a Hero: Train with the Saints, is a Catholic virtue training manual aimed at boys and girls ages 9-12. 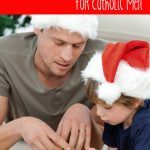 I’m sure you’ve heard of Kendra, the Catholic wife and mother behind Catholic All Year. Printable Prayers is her Etsy shop, full of prayers, saint quotes, and Bible verses, made just for you to print at home, online, or at a local copy shop. Kendra even takes custom orders if you don’t see something you like. Want an inspirational quote for your daughter’s room? 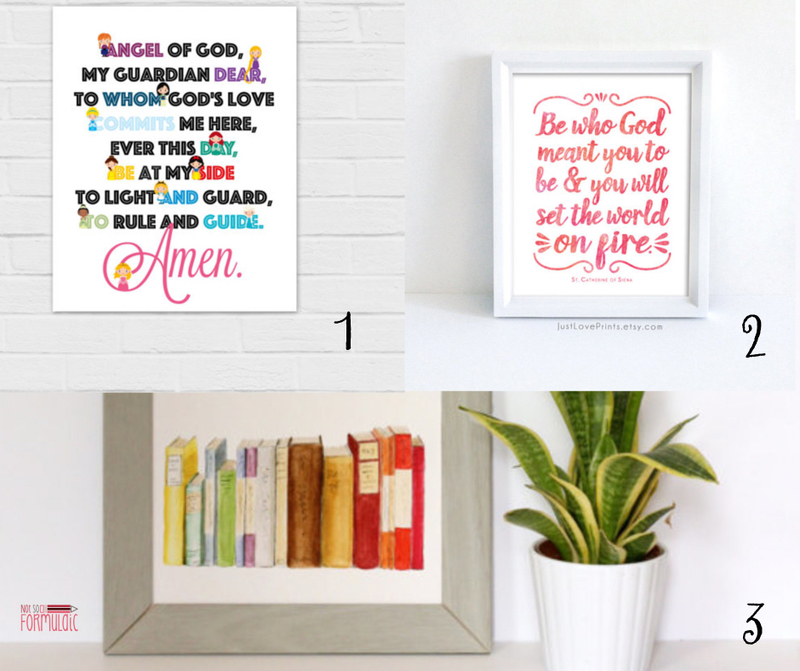 Look no further than Lindsey at Just Love Prints – your go-to shop for Catholic artwork and gifts. Rachel and Jordan are the married couple behind Pebble Creek Prints, your purveyor of delightful watercolor and photography prints, note cards and gift tags. Rachel paints each of the original works with ink and watercolor, digitizes them, and has them professionally printed. Jordan is the man behind the camera for the stunning photography prints. Rachel and Jordan mainly focus on nature, because that’s where they feel most at peace. Aleesa is the creative genius behind Saongjai, the Etsy shop offering heartfelt, handcrafted, and Catholic goods for everyone. Her custom patron saint rosaries are the perfect gift for your growing girl. LittlePrayingHands makes teething rosaries made of food grade silicone. They are soft for teething and are great for babies and toddlers to chew on while introducing this important part of our Catholic faith. The best part? As children get old enough, they can use their RosaryChew to pray with the family. Ruth is a Catholic homeschooling mother of seven and grandmother to four. Her family lives on a 1/2 acre mini farm raising bees and a small flock of hens. They also have some fruit trees and a small organic fruit, vegetable and herb garden. Loreto Rosaries is a family-owned business, and a portion of the sales goes to Mary’s Shelter – an organization for women in crisis pregnancies. Unique, handcrafted gifts tailored to your special someone. These items are sewn and embroidered by master seamstress Anne, using the same love her grandmother showed her when Anne learned to sew. Adrianna is a Catholic single mom of three kids and the owner of My Little Felt Friends. She sells handcrafted religious items for the whole family. 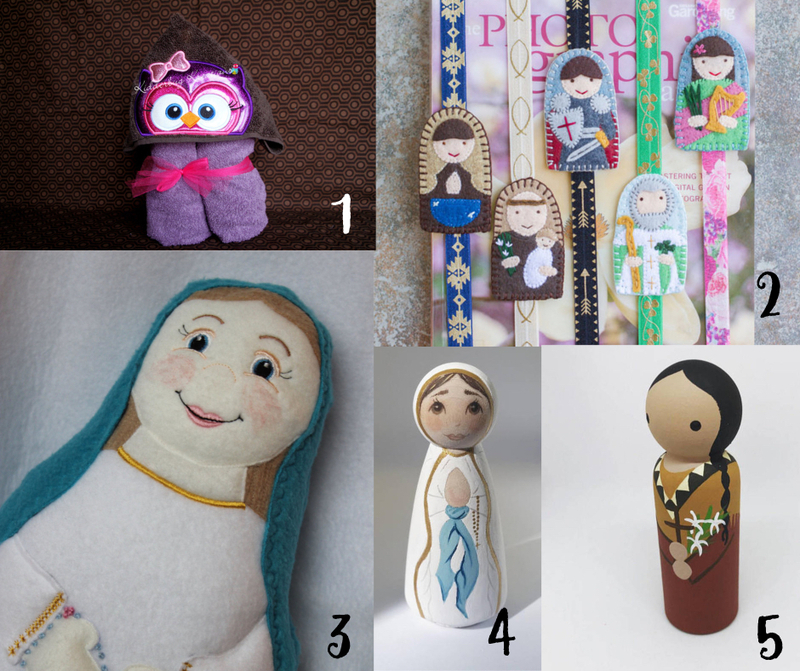 From felt saint dolls to bookmarks to Nativity scenes and more, you’re sure to find something for any age and occasion! Last day for Christmas delivery: varies; see website. Ann-Marie is a stay-at-home, homeschool mother of 4 boys. She started Trendzilly in late 2013 to generate additional income and inspire little ones in the faith by creating and selling handmade soft saint dolls along with many religious, holiday and party printables. Her dolls are made of soft fleece, are cut by hand, and have a sweet machine embroidered face. 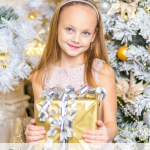 Ann-Marie puts great care into the quality of each doll and happily accepts custom orders. Katie is a stay at home wife and mother of a 2 year old (and another on the way!) Her shop features hand painted wooden peg doll saints; custom orders welcome. Kristina from Emmaus Road Pegs makes beautiful, hand-painted saints and bible story characters. Check out her instagram above, then visit her Etsy shop for individual pegs and her website for the saint of the month subscription. Our girls face so much. This Christmas, let’s give them the gift of faith. Aren’t they sweet? My girls have some – I should have added them! I need to see if the rosary chews come in bulk. :p There were four nieces and nephews born this year in my family and they all need one!! So cute! They very well may be!